Our lives are like a play, we are told. The word in Sanskrit for our play is leela, and indeed, I do read a person's life like a play, a grand better-than-Shakespeare type of dramatic narrative. To understand, I often want my beginning students to make 3 overlapping dials made out of cardboard, with the outermost dial representing the houses (bhavas), the middle one representing the constellations (rashis), and the innermost one representing the "planets" (grahas). These dials can independently rotate, but become fixed in relationship to each other at the time of a person's birth, altogether forming the kaleidoscope that I have referred to in years past. Put a pointer through the middle of these overlapping dials and point it to what graha is active by dasha. That graha has the mic and is directing traffic up on stage in the play of the person's life. the bhava is the context that all of this is happening in. For example, consider the play, Hamlet. It begins famously with the prince Hamlet in a cemetery-like environment, meeting the ghost of his father. Here the planet is Mercury, the prince, in the environment of the rashi Pisces, the resting place, in the context of an eighth house, a Hades subrealm of yet incomplete transformation. Putting it all together, Mercury would be debilitated in Pisces in the eighth house. I think it is really compelling, the idea that what is born of the birth of a chart is not so much a character (Hamlet) as a play (Hamlet) that includes the character. That is, our birth is the birth of a play more than the birth of just a character. Manifold "people", narratives, and situations are born when we are born, and we are all of That. We are the Dancing. We are not just a singular dance, or only a dancer, or heaven knows, a dance floor. What would be the ascendant, the lagna, of the chart described above? Leo, the determination of a king. That is the play. The eleventh and second houses also of course indicate the gains of wealth of the kingdom. The debilitation and eighth house placement of Mercury who rules these houses would indicate that there is indeed something rotten about all of these fields of experience. The seventh house to Mercury would be the context and environment of the love interest of young Hamlet, namely Ophelia. This virgin Virgoan placement would be well enlivened by a direct Mercury aspect, but that Mercury (Hamlet) is debilitated, and by extension, she becomes so too. Her madness is an extension of Hamlet's. The chart placement would moreover portend her death in the play as well because of the involvement of all three death indicating houses, the second, the seventh, and the eighth. The mother? Ah, the mother. Much has been written of the psychoanalysis of Hamlet. Is the mother the real enemy in the play? Perhaps, because the Moon (the mother) rules the twelfth, the end of the king of Leo. Note that the Moon is also the only enemy of Mercury, which is Hamlet. To tell more of the play, I would want to know more of the planets' positions. The other grahas would probably fulfill the involvement of the foreign travel, the role of Rosencrantz and Guildenstern, the plentiful use of poisoned swords and other details of the play. Since the outer two dials are fixed together with the Leo ascendant, all we would need are the other grahas' positions, but even with what we have, more could be said. So much of the play about death, suicide and familial killing is foretold by the first scene. Mercury's friends, Hamlet's friends, are the Sun (the elder Hamlet) and Venus, Horatio (Hamlet's best friend). All three, Mercury, Sun, and Venus (who are always nearby each other) are textually in the eighth house during the Mercurial dasha of the start of the play. Thus the lord of the first is in the eighth and the lord of the tenth and lord of the third are there too. That Venus (Horatio) is the only one left standing (a tenth house implication) by the end of the play is suggested by the exaltation of Venus in that eighth house of Pisces. Also, Venus dasha follows the time of loss (Ketu) that follows Mercury, and Horatio is specifically indicated to be the one left to tell the tale (a third house implication). So, this is just a little bit of understanding of one great play as seen through a few placements. Imagine the grandeur, the magnificence, of each and every person's personal play when we include ALL of the grahas, interacting, fighting, loving, liberating, controlling and completing each other in the great rotating kaleidoscope that is the sky. It is known that Shakespeare wrote a dictionary of Sanskrit, and so he may be presumed to be familiar with Vedic notions such as the leela. He may have even looked at the Jyotish chart of the moment (a prashna) for inspiration. The first folio of Hamlet was published in 1603. Looking at the chart for March 26, 1602 at approximately 4:30pm in Stratford-upon-Avon in England, one can see just such a chart as we have been discussing here. 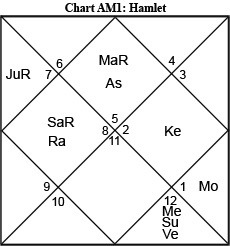 This chart depicts a warrior Mars rising in the kingdom of Leo, activating by aspect the fourth house of Scorpio, the heart and home of the kingdom, where live two malefics, a debilitated Rahu and an unfriendly Saturn who in turn activates by special aspect the sixth house of enemies. For now, I will leave it to the reader to interpret other components of the play from this chart. (c) copyright 2013 Michael Laughrin. From the February/March, 2013 issue of Michael Laughrin's North American Jyotish Newsletter. Click to subscribe to this free Jyotish newsletter.